1 PREHEAT OVEN AND COOK FARRO Adjust rack to middle position and preheat oven to 450 degrees. Combine farro, stock concentrates, and 3½ cups water in a medium pot. Bring to a boil and cook until farro is tender, 30-35 minutes total. TIP: If water evaporates before farro is cooked, add a splash more. 2 PREP. Wash and dry all produce. Trim and discard bottom woody ends of asparagus. Cut off fuzzy tips and set aside. Chop stalks into ½-inch pieces. Slice zucchini into thin rounds. Mince or grate garlic. Halve, peel, and finely dice onion. Zest, then halve lemon. 3 ROAST VEGGIES. Toss asparagus tips, zucchini, and a large drizzle of olive oil on a baking sheet. Season generously with salt and pepper. Roast in oven until nicely browned, 15-20 minutes, tossing halfway through. 4 COOK AROMATICS. Meanwhile, heat a drizzle of olive oil in a large pan over medium-high heat. Add onion and cook, tossing frequently, until soft and translucent, 3-4 minutes. Add garlic and cook, tossing, until fragrant, about 1 minute. 5 FINISH FARRO. Stir asparagus stalk pieces into pot with farro about 5 minutes before farro is done (grains should be just shy of al dente). Drain once both are tender, then add to pan with onion and garlic. Stir in juice of one lemon half, half the lemon zest, half the Parmesan, and 1 TBSP butter. Season with salt and pepper. 6 PLATE AND SERVE. Divide farro mixture between bowls. 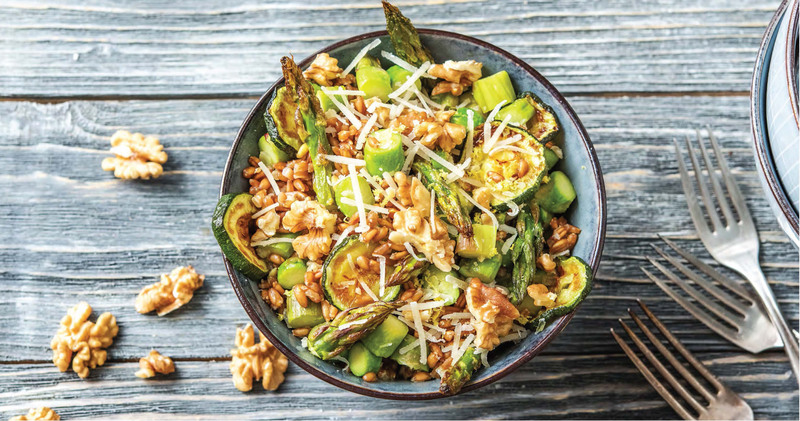 Top with zucchini and asparagus tips. Sprinkle with walnuts and remaining Parmesan and lemon zest. Cut any remaining lemon into wedges and serve on the side.